Music lovers and Windows Phone 7 owners can rejoice – Zune Pass is available for the new Microsoft mobile platform, enabling the free downloading of music to PCs and phones. Accessed via the Zune desktop client, Zune Pass is a subscription service that you can use to enjoy unlimited music on PCs, Xbox 360 consoles, Zune HD players and Windows Phone 7 devices. Currently being promoted with a 14 day trial, Zune Pass can be used to load your phone with cool new music, to download tunes based on your previous listening habits and it can also be used to stream music to your Xbox 360, PC or phone. To take advantage of Zune Pass, you will first of all need to have the Zune desktop client installed on your PC. With this installed and your Windows Phone 7 synchronized with your computer, in the Zune client go to Settings > Account > Summary > Zune Pass > Get a Zune Pass now. The 14-day trial is a good place to start, so select this and click Next. Zune will then ask for your credit card details, so these will need to be entered; if you have previously purchased an app via Zune, your details will be retained. Click Sign Up to continue and complete the sign-up to the Trial Pass, and note that you must use the Cancel Zune Pass option prior to the expiry date of your Trial Pass. To take advantage of free streaming of music to your PC, click the Back button to return to the main Zune screen and then go to Marketplace > Channels; here you can take advantage of free music streaming to your PC. For instance if I wanted to enjoy some rock music I would select the Rock channel, open the list of songs that are featured within and to listen to these I would use the Subscribe button to prompt the Zune client to download the tracks. 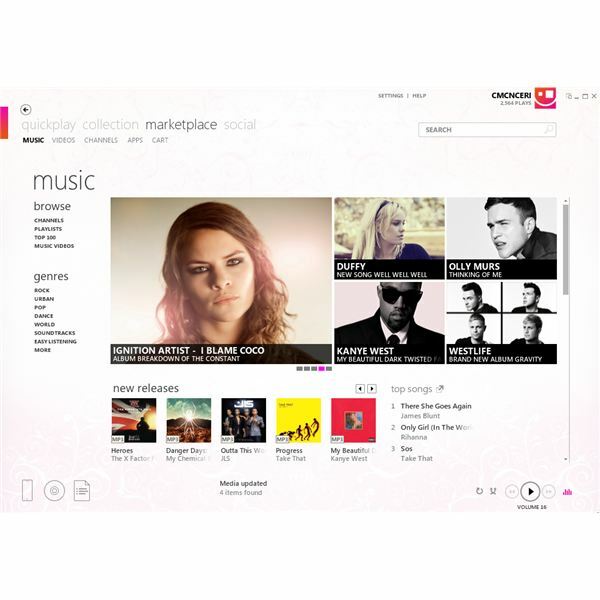 You might also find songs by using the Zune client search tool; the search results will display music and videos that are close matches, and you should note that movies can also be synced with Windows Phone or your PC, although these require Microsoft Points whether you’re buying or renting. Note that although the data is downloaded to your computer, the tracks cannot be kept or added to another media player – they will be removed at the end of the current subscription billing period, unless you opt to purchase the track. To buy a track from Zune Pass, right-click the title and select Buy or Add to Cart – note that you will require Microsoft Points in order to do this, which must first be purchased via Settings > Account > Summary > Microsoft Points > Buy Microsoft Points. Meanwhile you can sync a title to your Windows Phone 7 handset by right-clicking and choosing Sync with [DEVICENAME]. When your phone is next connected, the title will be synced to your Music & Videos hub, and will be ready to play.